Director – Rod Hardy, Screenplay – David [S.] Goyer, Based on the Comic-Book Created by Jack Kirby & Stan Lee, Producer – David Roessell, Photography – James Bartle, Music – Kevin Kiner, Visual Effects – Gajdecki Visual Effects (Supervisor – Jon Campfens), Special Effects Supervisor – Dean Lockwood, Makeup Effects – Lindala Make-Up Effects, Inc. (Created by Tony Lindala), Production Design – Douglas Higgins. Production Company – Marvel Studios/Fury Productions Limited Partnership/National Studios, Inc. When the Hydra Organisation conducts a raid to steal the cryogenically preserved body of the super-villain Baron Wolfgang Von Strucker, S.H.I.E.L.D. recalls Colonel Nick Fury back into active service. Fury realises that Von Strucker’s daughter Andrea, nicknamed Viper, has taken control of Hydra and retrieved her father’s body because it contains samples of the deadly Death’s Head Virus. Fury goes to Berlin to try and ascertain Hydra’s plans from the captured Armin Zola. However, he runs into a trap set by Andrea who kisses him with a deadly poison that leaves him with hours to live. Defying orders, Fury heads back into action to find Andrea and synthesise a potential cure from her blood. Meanwhile, other agents set out to find the location of missiles containing the virus that Hydra is planning to fire on New York City. Back before Marvel Comics held an extraordinary dominance of the cinematic marketplace with films such as Blade (1998), X-Men (2000), Spider-Man (2002), Daredevil (2003), Hulk (2003), The Punisher (2004), Elektra (2005), Fantastic Four (2005), Ghost Rider (2007), Iron Man (2008), Captain America: The First Avenger (2011), Thor (2011), The Avengers (2012), Guardians of the Galaxy (2014), Ant-Man (2015), Deadpool (2016), Doctor Strange (2016), Black Panther (2018), Venom (2018), Captain Marvel (2019), plus various sequels and reboots of these, as well as the tv series’ Agents of S.H.I.E.L.D. (2013– ), Daredevil (2015-8), Agent Carter (2015-6), Jessica Jones (2015– ), Luke Cage (2016-8), The Defenders (2017), Inhumans (2017), Iron Fist (2017-8), The Punisher (2017– ) and Runaways (2017– ), there was another whole era of Marvel Comics on the screen. We are talking here about tv series such as The Amazing Spiderman (1977-9) and The Incredible Hulk (1977-81), film spinoffs released from re-edited episodes of these such as Spider-Man (1977), The Incredible Hulk (1977), Spider-Man Strikes Back (1979) and Spiderman and the Dragon’s Challenge (1981), would-be tv pilots that never got off the ground for Dr. Strange (1978), Captain America (1979) and Captain America II (1979), and the odd cinematic film such as Captain America (1990), The Punisher (1990) and the notoriously unreleased The Fantastic Four (1994). Most of these have been revived in the YouTube/bit torrent era and are regarded as curiosities for the more sophisticated to point at and laugh. 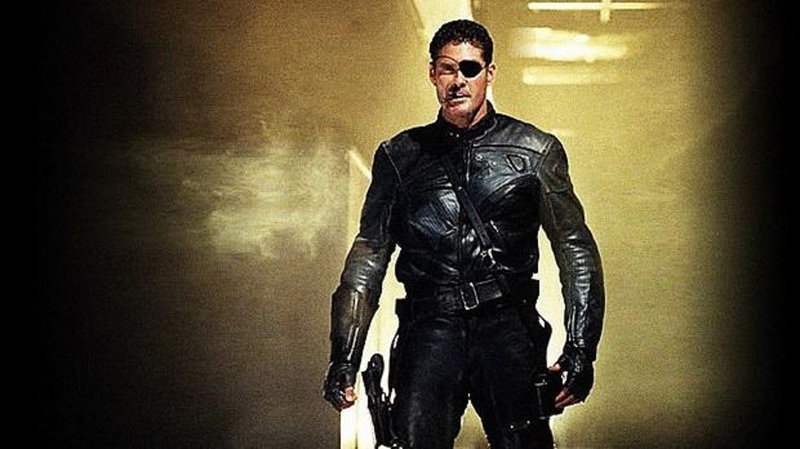 Nick Fury, Agent of Shield (note the spelling of Shield as a regular word in the title as opposed to the acronym S.H.I.E.L.D. used in the comic-book title) was one of these. It was made as a tv pilot but failed to get the go ahead as a series. It makes for fascinating contrast to the more familiar Samuel L. Jackson incarnation of Nick Fury in the Marvel Cinematic Universe. It is important to remember that Nick Fury, Agent of Shield was made at a point when the public outside of comic-book readers had no idea what S.H.I.E.L.D. was. The film is not situated within the wider Marvel Universe and, although it does incorporate a number of Marvel villains and Nick Fury supporting characters, is pitched as a fantastical James Bond adventure about a secret government agency – crucially, while science-fictional devices do plentifully circulate, there are no superheroics. While everyone is now used to a bald-headed African-American Samuel L. Jackson as Nick Fury (and where the Marvel comic-book universe has even been retconned to fit this look), the Nick Fury we have here resembles more the way the comic-book character looked like back in 1998 – as a Caucasian with full head of hair and an eye patch. The role is cast with David Hasselhoff, in a career lull following the heydays of Knight Rider (1982-6) and Baywatch (1989-2000) and just before the troughs of self-parody he descended to in the likes of Hop (2011) and Piranha 3DD (2012). There are marked differences between the two characterisations – Samuel L. Jackson is tough as nails but in charge of a fighting unit; here David Hasselhoff is a tough but individualistic outsider who is grudgingly brought back into the organisation as a field agent where he is determined to flaunt authority and do everything his way. In terms of action, Nick Fury, Agent of Shield is shot as a standard tv movie. Nothing goes beyond the usual canned gunplay, fistfights and martial arts sequences of this era. There are the types of improbable gadgets you only get in spy films – a lifelike android that acts as a decoy of David Hasselhoff, another lifelike bomb droid that impersonates Tom McBeath, a gun keyed to Hasselhoff’s palm print that electrocutes anybody else who tries to use it. One of the more fascinating aspects in retrospect is seeing the Hydra agents aim their missile at New York City and the target in the sights being none other than the still standing Twin Towers. David S. Goyer’s other screenplays include the Jean-Claude Van Damme action film Death Warrant (1990), Full Moon’s Demonic Toys (1992) and Arcade (1994), The Puppet Masters (1994), The Crow: City of Angels (1996), Blade (1998), Dark City (1998), Blade II (2002), Batman Begins (2005), Batman: Gotham Knight (2008), The Dark Knight (2008), Jumper (2008), The Dark Knight Rises (2012), Ghost Rider: Spirit of Vengeance (2012), Man of Steel (2013) and Batman V Superman: Dawn of Justice (2016). Goyer has also directed the excellent non-genre film ZigZag (2002) about an autistic boy, Blade Trinity (2004), The Invisible (2007) about a disembodied teenager and the possession film The Unborn (2009). Goyer has also produced the genre tv series’ Sleepwalkers (1997) about dream researchers; FreakyLinks (2000) about paranormal investigators; Threshold (2005) about the investigation of a UFO; the cinematic adaptation of the Marvel Comic Ghost Rider (2007); the tv series Flash Forward (2009-10) about a mysterious worldwide premonition; the tv series DaVinci’s Demons (2013-5) about a fantastical secret history of Leonardo Da Vinci; the tv version of Constantine (2014-5); the ghost story The Forest (2016), the robot dog film A-X-L (2018), the animated web series Constantine: City of Demons (2018), the Superman prequel tv series Krypton (2018– ) and the A.I. film Tau (2018). .
Rod Hardy is an Australian director who once made the medical vampire film Thirst (1979) and has directed a good deal of US tv since then. He also made the tv mini-series 20,000 Leagues Under the Sea (1997) starring Michael Caine.